New Delhi/Dehradun: Prime Minister Narendra Modi on Wednesday celebrated Diwali with troops of the Indian army and the Indo Tibetan border police posted in Uttarakhand's Harsil, situated at over 8000 ft from the sea level. Greeting the Indian Army and ITBP personnel posted at the icy heights, the PM said that their devotion to duty in extreme climates and tough geographical conditions adds to the strength of the nation and makes people feel secure. 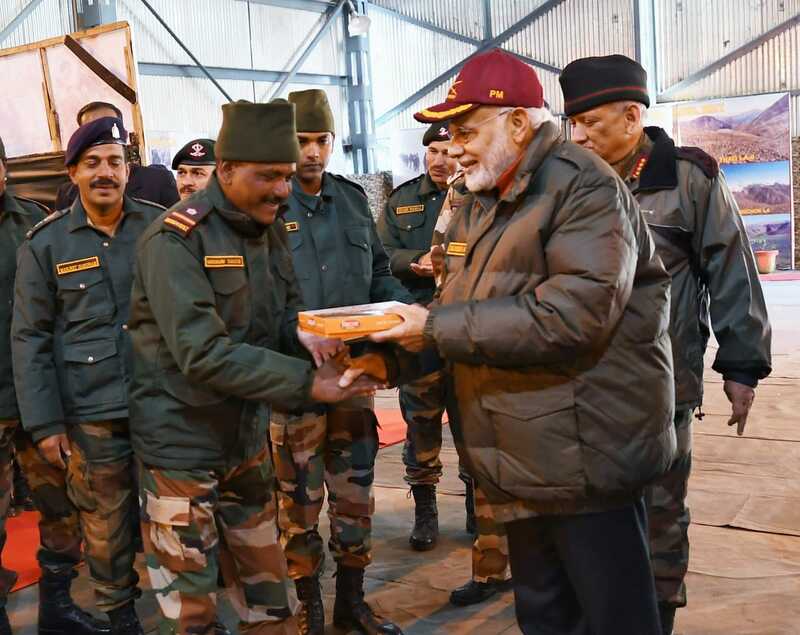 Indian Army chief General Bipin Rawat and Director General Indo Tibetan Border Police Surjeet Singh Deswal were also present during the PM's meeting with the troops.On the occasion, the PM offered sweets to the jawans. The PM also visited the Kedarnath temple and offered prayers there.He also took a round of the whole re developed area that was hit by the flash floods in 2013. PM Modi , along with Uttarakhand Chief Minister Trivendra Rawat also had a round of the ghats along the Mandakini that were buikt after the floods. Harsil station is situated at over 8000 ft from the sea level and it is close to India-China border and famous religious place 'Yamunotri Dham. It is the last most populated place in the valley and known for its scenic beauty. This was also an important transit station for traders travelling on the century old ancient silk route stretching from Central Asia to Europe . Traders used to stay here for both selling and procurement purposes. In 2015, the Prime Minister celebrated Diwali with BSF jawans on the LoC near the Indo-Pakistan border in Punjab, while in 2016, he was with ITBP jawans in Himachal Pradesh, on the occasion of the festival of lights.